A man surveys the damage after airstrikes by pro-Syrian government forces in the rebel-held al-Sakhour neighborhood of Aleppo, Syria, Feb. 5, 2016. The next few days will “tell the story” on whether parties are serious about implementing a cease-fire in Syria and moving forward with talks on a political transition, Secretary of State John Kerry said Friday. His comments came two days after a U.N. envoy suspended fragile proximity talks between the Syrian regime and opposition, following opposition protests against a Russian-backed Syrian government offensive in Aleppo. “We will know in the next few days who is serious and who is not,” Kerry said during a news conference with Colombian President Juan Manuel Santos. He added that a number of “modalities” for a cease-fire and for providing humanitarian aid to besieged areas of Syria were being discussed. Russia and the United States are among the countries and world bodies that make up the International Syria Support Group, which has been a catalyst for launching the latest effort to resolve Syria’s crisis. The group will focus on efforts to secure a cease-fire in Syria when it meets Thursday in Munich. The group will also discuss the political talks between the government and the opposition, which are set to resume by February 25. Russia has rejected Western claims that its support of President Bashar al-Assad and his military resulted in the breakdown of the talks. “We think that this opinion is incorrect. We cannot agree with it,” said Kremlin spokesman Dmitry Peskov, according to Russia’s Interfax news agency. 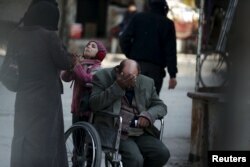 A girl with her father in a wheelchair asks for help from passers-by to pay a medical bill, in Douma, Syria, Feb. 3, 2016. A sticking point between Assad regime backer Russia and the other members of the International Syria Support Group has been who should be labeled "terrorists." A U.S.-led coalition campaign has targeted Islamic State and Jabhat al-Nusra militants in Syria. Russia has backed the Syrian government's targeting of moderate rebel groups. Russia’s current stance in the Syrian conflict could make progress on the political front difficult. Ultimately, Russia may be focusing on its own interests and stability as it continues to back the Assad regime with assaults on rebels, said David Schenker, a regional analyst at the Washington Institute for Near East Policy. He said that when Russia talks about supporting Syria, it means keeping the Assad regime, “or at least a facsimile thereof,” in power indefinitely. 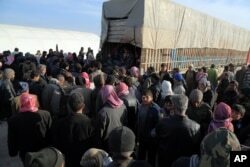 In this photo provided by Turkey's Islamic aid group of IHH, Syrians fleeing the conflicts in Azaz region congregate at the Bab al-Salam border gate, Syria, Feb. 5, 2016. As the two sides mull their next moves, Syria’s humanitarian crisis continues to worsen. Russia’s intensified bombing campaign has forced tens of thousands of Aleppo residents to flee from their homes in recent days. Kerry said there is “evidence that is clear” that Russia had been using nonprecision “free-fall bombs” in Syria, which have struck such sites such as hospitals and resulted in “large numbers” of civilian deaths. “This has to stop,” he said.